A things to do in Bangkok post could easily turn into a book. This is a city with so many facets, so many variables that in 20 years of travel to Thailand, I’ve still not seen it all, nor had enough. These days I bring my children, they love this city too and ask to return often. 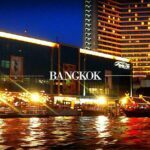 This post is aimed at new travellers, with children or without, who have no idea what Bangkok has to offer. Let me give you a brief taste of this fascinating city. 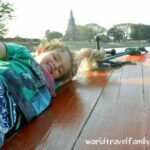 I can’t include everything but these are some of our favourite things to do in Bangkok, with children, with family, with friends. A friend once asked me, a new traveller to Thailand, what my number 1 thing to do in Bangkok would be. I told her to visit the Grand Palace. She ignored me, went to the shopping malls instead, then hopped on a plane to Phuket. Big mistake! 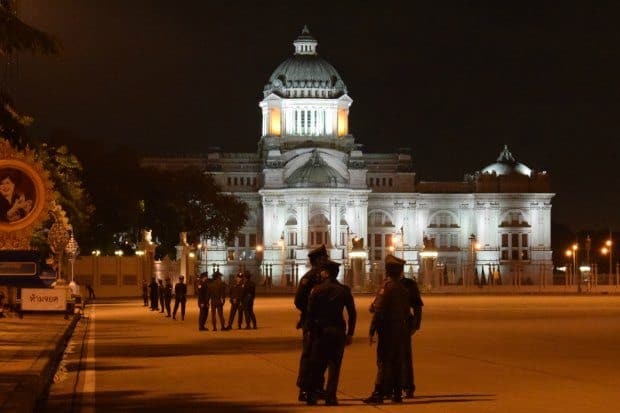 You can shop and visit beaches anywhere in the world, but there is only one Bangkok and only one incredible, stunning, beautiful Grand Palace. It was home the dazzling Kings of Thailand since 1782, in the reign of King Rama I. Yes, it will be a long, hot visit, yes there will be crowds, but you can’t come to Bangkok and not see it, it’s out of this world. Interestingly, the Royal Family moved out of this palace around the time of Rama V. This King constructed the New Palace ( below) the old palace, with its collection of magical buildings was too hot, so the story goes. The rooftops of the Grand Palace Bangkok, seen from the Royal fields. To me this is one of the most enthralling places on the planet. King Rama V loved to travel. His New Palace is modeled on Versailles in France. I haven’t been inside and it’s closed at the moment because of the Royal mourning period. Try to take a look at night, it’s so pretty. Wat Arun’s delicate floral porcelain is very different to the other Wat’s decorations. There are a few big-draw Wats that you need to see. The bigger Wats have an admission charge. Children are free if they are shorter than the ticket office desk, usually. Wat Arun, the Temple of the Dawn, right on the river bank, almost opposite the Grand Palace and Wat Pho. Wat Pho, the temple of the Reclining Buddha. The Buddha is 43m long and gold and mother of pearl encrusted. 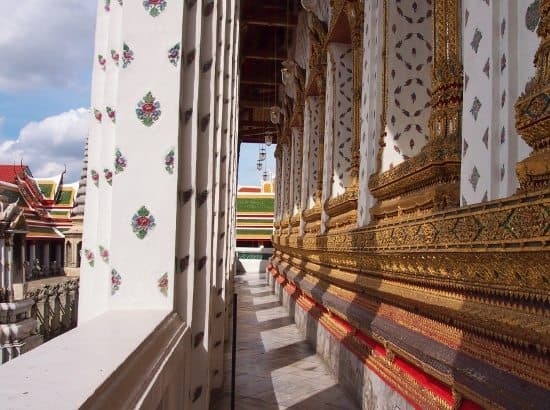 Wat Phra Kaew, the temple of the Emerald Buddha, is within the Grand Palace and covered by your admission charge. Don’t restrict yourself to the big name Bangkok Wats. 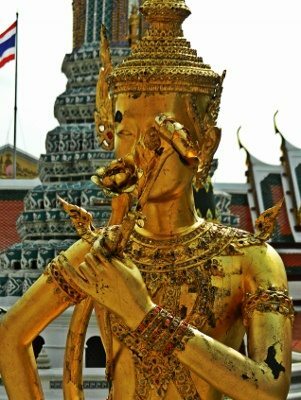 As you explore on foot you will find a Wat almost on every street, go in, take a look, be respectful. They are all stunning and fascinating places to see. 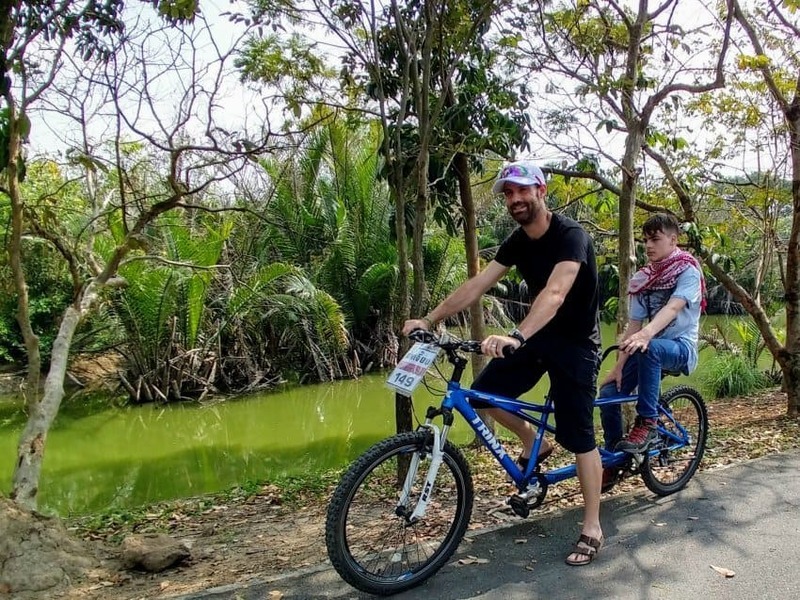 Some of the Bangkok Green Lung area is tarmac paths, but there are also board walks and dirt forest tracks, it’s an easy day of cycling for families and kids sized bicycles ( and tandems) are available. Bangkok’s Green Lung ( an area called Phra Pradaeng or Prapaedeng) is a part of central Bangkok that most tourists never see but that is popular with local visitors. Take a little ferry boat ( around 20 Baht from Klong Toey Port) to this island of green wetlands stuck in a loop of the Chao Phraya River. On arrival grab a bike and explore. You’ll find temples, conservation area, fighting fish museums, towers for viewing birds and greenery ( Bang Krachao Park), even a weekend floating market. It’s a trip well worth doing. Bike hire is normally included in the fee you pay to the boat lady. This is a welcome, calm antidote to Bangkok’s bustle. There are a few restaurants and cafes over there to grab lunch. There is a famous hotel come guest house within the Green Lung area, check out the Bangkok Tree House here. If you’ve never seen a brightly painted, ornately sculpted Hindu temple, now is your chance. This one is in the Silom district of Bangkok, on the corner of Pan Rd. This street just happens to house one of our favourite hostels. Pan Rd has excellent vegetarian food too. The iconic long tail boats are a great way to see another side of Bangkok. The Chao Phraya river is large and choppy, it flows through the heart of Bangkok and is a busy thoroughfare. Find yourself a long tail boat driver and get him to take you on a tour of the khlongs, the waterways behind the main river. You’ll see a way of life, a style of building, that would seem to belong in Bangkok’s past, but still exists if you take the time to look. Watch out for giant monitor lizards too, you’ll find them in all of Bangkok’s klongs and lakes. 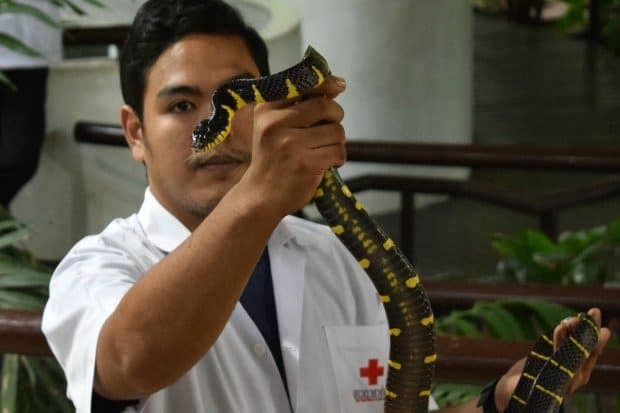 Yes, you read that right, you need to go to the hospital to find out all about Thailand’s snakes and their venom. The Bangkok Hospital Queen Saovabha Memorial Institute has a venom research and antivenom production facility. Over time, this hospital department has created a tourist facility of educational and entertainment value. We visited in 2016, for the first time. It’s really worth going, highly recommended and more ethical than other Bangkok snake shows. You can easily spend half a day here but get here at the right time, the snake shows are at 11am ( weekends) and 2.30pm ( week days) ( at time of publication please check for yourself). You can also see venom extraction if you get to the hospital snake department at the right time. The snake farm shuts early, at noon, on weekends. There is a fascinating museum on site too. 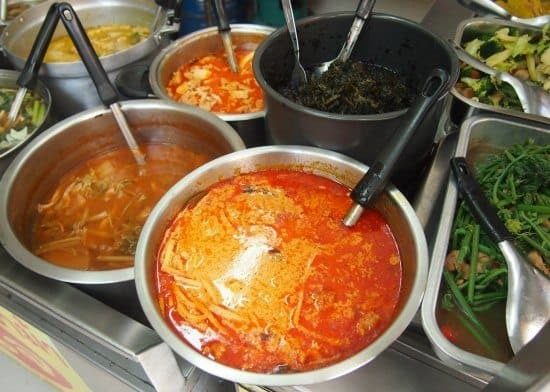 There are several to chose from, lunch time, early evening or late at night, touring Chinatown or other districts. Check out the food tours available in Bangkok here and book before you arrive. You may like to check out our complete guide to Thai food before your visit. For new visitors to Thailand, this is a good way to build confidence in ordering Thai food from the best outlets, the places the locals visit. 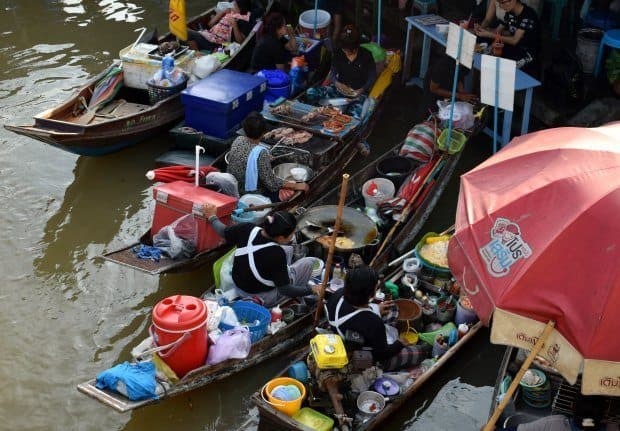 Take a Day Trip to a Floating Market, or Not. The big, famous floating markets are a fair way out of Bangkok, about 100 Km. Many people visit as part of a day tour or organised morning trip. We visited Damnoen Saduwak, the main tourist market, from Amphawa, a nearby floating market and one we found much nicer. If you have time, get down to Amphawa for a day or two, it’s very different to Bangkok and the markets specialise in amazing local seafood. 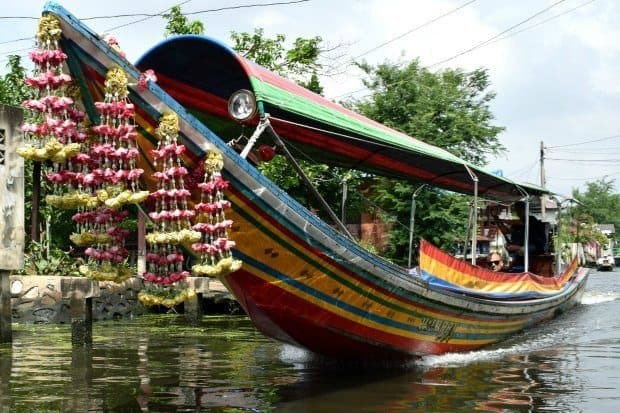 If catching local buses and making your own arrangements isn’t for you, you can book a Floating Market Tour before you arrive or try to organise a local driver to take you. Bargain hard over price. There are plenty of other floating markets in and around Bangkok, if you visit our Amphawa post ( above) you can find out more. Tha Kha is another good one and this can also be visited as a day trip from Bangkok along with the famous railway market, Maeklong ( where stall holders get out of the way of oncoming trains 8 times per day). Find our full post on a Tha Kha and Maeklong tour here. 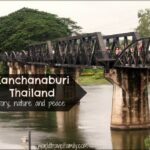 Kanchanaburi and the famous Bridge on the River Kwai are another popular day trip from Bangkok. Again, we took the train out to Kanchanaburi and stayed a week, but for a short visit, book a Kanchanaburi Tour or even take a taxi. 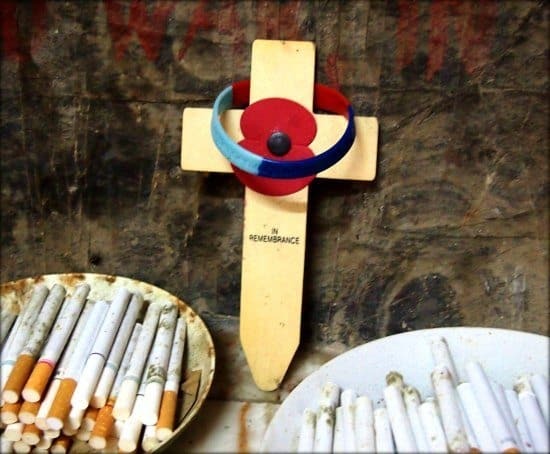 The Death Railway and a couple of interesting war museums are here. It’s worth staying longer for the peace of life on the River Kwai. The infamous tiger temple is ( was) in Kanchanaburi. At the time of writing it had thankfully been shut down after the monks’ involvement in tiger trafficking was exposed. It seems to open and close quite regularly so check for yourself. We wouldn’t recommend going there nor to the nearby Kanchanaburi Safari Park after seeing a tiny leopard cub chained in Kanchanaburi market by way of advertisement. 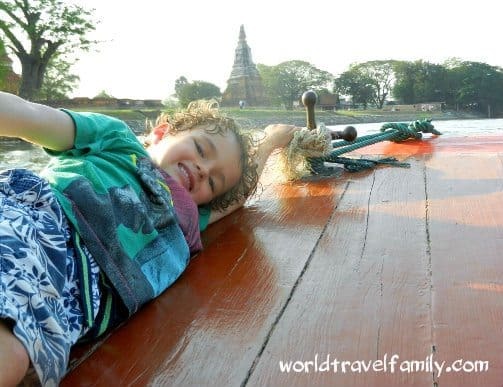 Same story here with Ayutthaya, you can visit this second ancient capital as a day trip by booking an Ayutthaya tour, or head out there by train and spend a couple of days exploring and taking boat trips at your leisure. Ayutthaya is a UNESCO listed heritage site and Thailand’s second ancient capitol after Sukhothai. Sukhothai can also be reached from Bangkok but bus time comes in at a hefty 10 hours or so. The top floor of the MKB centre, one of Bangkok’s huge malls, is an Aladdin’s cave of electrical gadgetry. Full of wonders and innovations, it’s worth taking a look, prices can be amazing but quality is variable. There are plenty more huge malls in the Sukhumvit district, clothes and shoes are a speciality too. We rarely visit this side of town. For genuine electronics try the Fortune Mall or Building. All of the usual high quality computer, photographic and phone outlets are here and it’s very hassle – free. You can claim back tax at the airport on departure. Best Blog Read Now! Getting to Ko Samui from Bangkok and a Scam to Avoid. Get a Traditional Thai Tattoo. Why not? I did, read about my sak yant here. 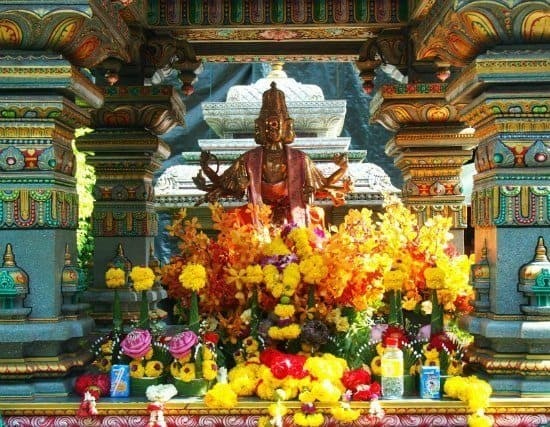 You’ll need to find a monk or an ajarn to perform the ceremony and bless you with protective magic. I’d rather you didn’t go, so I’m not going to tell you where it is. It’s here, it’s avoidable, it’s not an area you’ll find by accident. Don’t worry, you won’t see evidence of sleaze unless you go looking for it. 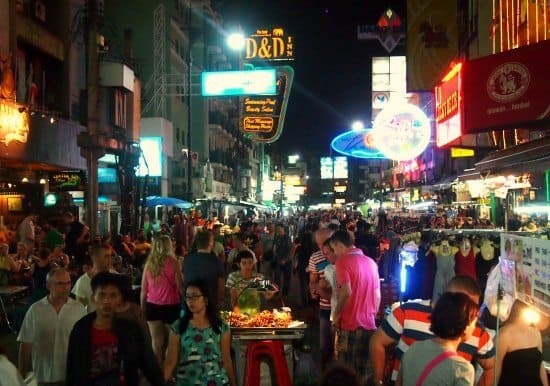 Visit the Iconic Khao San Rd. We tried this on our last trip and very much enjoyed pedalling genteelly around the old city at night. Our tour was complimentary, provided by our rather nice hotel, The Old Capital Bike Inn. 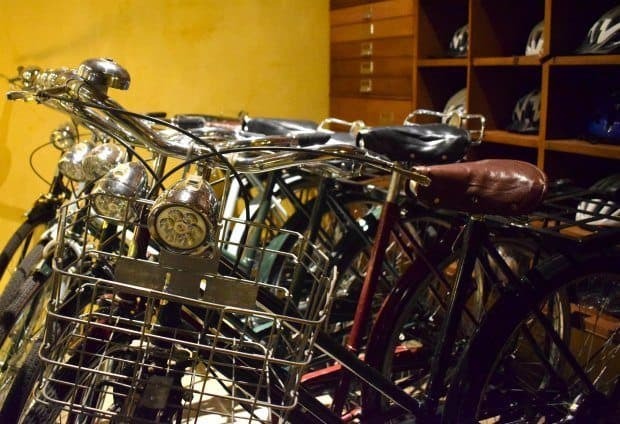 Other bike tours are available. There are loads more things to do in Bangkok and over time I’ll add them to this post, but for today, that’s enough. It’s one of our very favourite cities in the world and even now, after 20+ visits over 20+ years, we’re still enjoying the old and discovering the new. Ayutthaya Travel Blog. Things to Do. 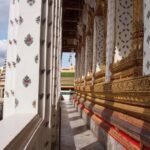 Grand Palace is THE main touristic attraction… but it’s definitely worth it! It’s really really impressive and beautiful, but yeah there’s quite a lot of people. Also the food tour is also a must-do! Thai food is just so delicious, a little bit spicy, but you’ll get used to it! Sure is, I’ve been several times now and it’s still amazing. My son said it was his favourite place in the world too and last time we went it was so hot and so crowded ! It’s just breathtaking.